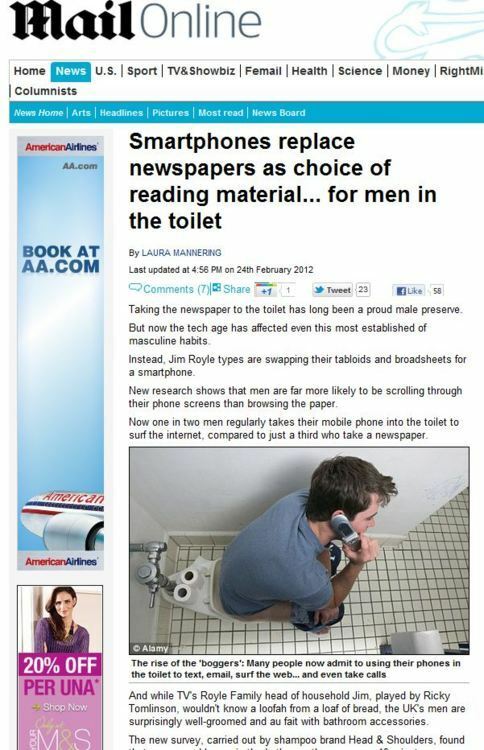 Taking the newspaper to the toilet has long been a proud male preserve. But now the tech age has affected even this most established of masculine habits. Instead, Jim Royle types are swapping their tabloids and broadsheets for a smartphone. New research shows that men are far more likely to be scrolling through their phone screens than browsing the paper. Now one in two men regularly takes their mobile phone into the toilet to surf the internet, compared to just a third who take a newspaper. So, who might be behind this story? A smartphone manufacturer? A new time-wasting app? Andrex? Nope. Head and Shoulders – the shampoo made by Proctor and Gamble. The new survey, carried out by shampoo brand Head & Shoulders, found that men spend longer in the bathroom than women – 19 minutes compared to 18 minutes on a typical week day. More than twice as many men as women take two or more showers a day – 19 per cent compared to nine per cent – and men are much more likely than women to regard a loofah and nail scissors as a bathroom essentials. Geordie men are the cleanest when it comes to bathroom habits, spending 26 minutes in the shower on a typical morning, while men from the north-west spend least time at just 16 minutes. At weekends, men in London indulge themselves with showers averaging an incredible 31 minutes. But our motivations for washing are more complex than they might seem – women are more likely to feel showering makes them feel more attractive, while men say a shower makes them feel more productive. So, what we have is a survey primarily based around shower habits with plenty of datamining to flesh out the bones – showing, for example, the areas where men are ‘cleanest’ because they spend longest in the shower, when common sense dictates that someone had to come top of that list. As an escape from the daily routine, one in five men thinks about singer Cheryl Cole in the shower, while women are most likely to think about Hollywood star Johnny Depp while washing. Scottish and Northern Irish women are particularly keen on Gary Barlow. So there we have it – a classic bait and switch, and a great example of a press release masquerading as news. This entry was posted in Uncategorized and tagged Head and shoulders, ketchum, Laura Mannering, Michael Douglas, proctor and gamble, survey on February 28, 2012 by Michael Marshall.